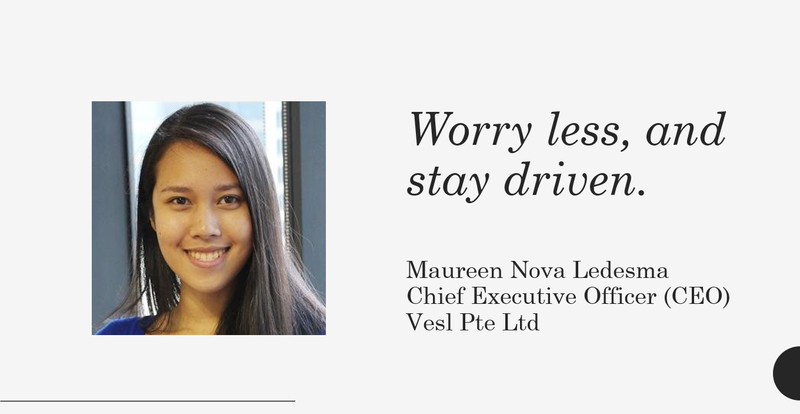 For the month of April, we’re delighted to have Maureen Nova Ledesma, CEO of Vesl Pte Ltd, share about her experiences in FinTech. It’s like taking care of a 3 year old versus taking care of a 15 year old kid. The 3 year old toddler (the start-up) is more unpredictable, fun, and there’s so much you can develop. You definitely need to be very hands on which can be challenging and frustrating. The 15 year old (corporate) just needs more maintenance than growth from the ground up. The reality is that talent is in shortage. It’s hard to see a successful insurance talent willingly move across to join a start-up. So we are always on the look-out for the right people to join us. Marketing an innovative B2B insurance product to local businesses can be quite tricky as well. It’s not as straightforward as B2C. It is can be even more challenging for those of us not from Singapore originally, so we have to exhaust all possible ways – both innovative and traditional. You just need to come from a good place within yourself, upon making the conscious decision to be an entrepreneur. Comfortable with your idea, and with your capacity to see it through til the end. We are in trade credit insurance. Honestly, there’s a lot that needs to be done for it to keep up with the times. We are doing the best we can to help the progress! Other areas of insurance however like car insurance and property insurance have seen significant progress in some parts of the world. Products will continue to be more and more data driven. Personal technology will get more personal, SMEs will like the pay-per-invoice trade credit insurance (wink), and Donald Trump will no longer be president of the USA. You should have put some money in bitcoin! Kidding aside, I’d say you’re doing just fine. Worry less, and stay driven.